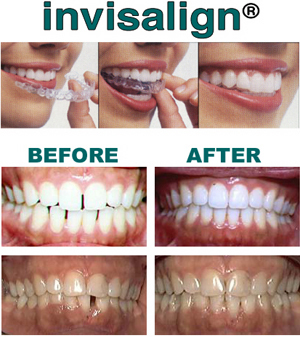 Invisalign is the invisible way to straigten teeth using a series of custom-made, nearly undetectable aligners. And it's been proven effective in both clinical research and in practices nationwide. So whether your teeth are crowded, too far apart or have shifted since wearing braces, You'll have a new reason to smile. Invisible, so no one can tell. Removable. to eat what You want. Does not have uncomfortable metal to irritate your mouth. Having a confident smile can change everything. With Invisalign you can get a stunning smile without most people even noticing you're going through treatment. Your Invisalign treatment will consist of a series of aligners that you switch out about every two weeks. Each aligner is individually manufactured with exact calculations to gradually shift your teeth into place. Invisalign is custom made for your teeth and your teeth only! What a remarkable way to transform your smile. Invisalign lets you live your life since its clear and removable.